Many people think that adopting a vegan lifestyle is expensive, but that’s simply not true. Much like any diet, the amount of money you spend largely depends on your daily food choices and ability to plan ahead. As a home cook who went vegan around three years ago, I’ve made many mistakes along the way, splurging on foods that I didn’t really need or buying items in too small of a quantity. Fortunately, now that I’ve got everything dialed in, I can confidently say that I spend less on food now than I did before the switch. Here are 10 things that I used to spend way too much money on, and some practical tips to help you save! 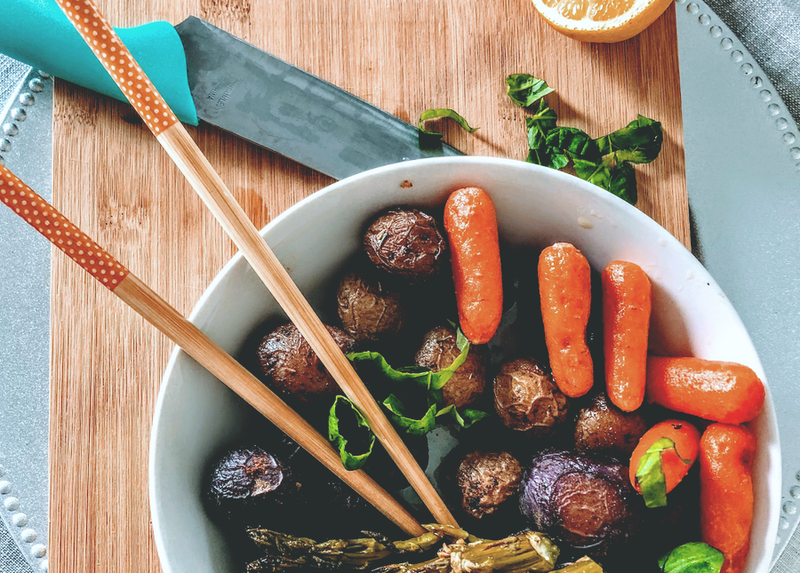 When people transition to a vegan lifestyle, they’re often advised to buy mock meats by brands such as Tofurkey and Gardein to help them recreate their favorite meals. While this isn’t bad advice per se, it’s not a great solution for your wallet long term. Because of their limited supply, mock meats are usually pretty expensive. Eating them every meal can add up pretty quickly, especially if you’re feeding a family. I found this out the hard way when I went back through some of my credit card statements and receipts from my first few months being vegan. What I eventually came to realize is that I didn’t need to be buying these products all the time. There are so many delicious meals that I could make that centered around whole-plant foods (fruits, veggies, beans, and legumes) that were far less expensive and way healthier. Take this chickpea salad sandwich for example. It’s filling, nutritious, cheap and can easily be served with a salad or baked potato as a main course. Switching the main focus of a dish from a “traditional protein” to starches, legumes, and veggies takes some getting used to, but it’s actually what most humans have done throughout history. Before the industrial revolution, meat has always been rather scarce, since it had to be hunted and required far more resources to produce via agriculture. It can be overwhelming at first, but once you start experimenting, a whole new world of possibilities will open up. As a side note: I don’t consider tofu to be a mock meat, considering it’s pretty cheap in most grocery stores, and made of 100% legumes. It’s also been a staple of Asian cuisine for centuries. Nutritional Yeast, AKA “Nooch,” is a staple in vegan cooking. If you’re not familiar, they’re basically just yellow flakes of yeast that give things a kick of umami or savoriness. At first, I was buying the stuff at Whole Foods and driving quite a long distance to do so. What I eventually learned is that you can order a bulk bucket of the Nutritional Yeast online via sites like Amazon and Jet. Not only was it around half the price (per pound), but it also meant that I didn’t need to drive out of the way to find a specialty store. Since it has an extremely long shelf life, I just keep a bucket in my pantry and re-order around every six to eight months. I suggest you do the same! Just like Nutritional Yeast, cashews are another one of those key ingredients that take vegan cuisine to the next level. I use them for making creamy sauces (by soaking and blending), pie fillings, and to add a toasty crunch to stir-fry and salads. Like all nuts, cashews are typically only sold in 8 oz or 16 oz bags at the grocery store. As a result, the price per pound is almost double as what you can get if you buy them in bulk online. Once I realized this, I started doing just that…ordering them in bags of 10 pounds. But then I realized that I could take it one step further. Rather than buying whole cashews, I started buying the cashew pieces, which are even cheaper. Since I mainly use them as an ingredient in other recipes it makes no difference to me whether they’re whole or broken up. While almond butter isn’t necessarily a vegan thing, I found myself using it more on things like toast as a replacement for eggs and cheese. But the problem is that store-bought almond butter (which I prefer to be 100% almonds) is around double the cost of the raw materials. While a pound of bulk almonds can be as little as $5-7 per pound, I’ve seen jars of almond butter go for $11 to $15 per pound, even at bulk-discount stores like Costco. So now instead of buying jarred almond butter, I’ll make my own using a blender or food processor depending on the batch size. Much like mock meats, store-bought vegan cheese brands are a great transition tool and something that I’ve relied on a lot in the past. Brands like Daiya are doing a great job of getting the flavor and the texture down, and I’ll still enjoy them on special occasions. They’re just so darn expensive! The good news is that for everyday cooking, it’s super easy to use Nutritional Yeast, Cashews, and Lemon Juice as the base for a homemade vegan cheese sauce. Once the cashews are soaked and super-soft you can use a blender — like the ones found here — to make a spreadable vegan cheese or cheese sauce that tastes good on almost anything! It’s way less expensive than the store-bought stuff and I’ve come to think that it tastes better, too. Some others like to skip the nuts and use tapioca starch and potatoes to make it gooey and stretchy. This method is even cheaper than mine! Spring rolls with cheap veggies like carrots, cabbage, and scallions (along with peanut dipping sauce) have become a staple in my household. But much like many of the other ingredients here, rice wraps were costing me an arm and a leg at my local grocery store. Sometimes up to $4.99 for a pack of 10! I was both happy and appalled to learn that they cost a fraction at any Asian grocery store or if I ordered them in bulk online. Now I stock up and keep hundreds in my pantry. They last for years, and it’s nice to always have them ready to go. While I’m not against buying fresh fruits and veggies by any means, I often have a hard time predicting how much I’m going to need throughout the week. In the days when I was less experienced, this meant I was regularly throwing things out because they’d go bad before I got to use them. Now, I buy about 70% frozen and 30% fresh. This makes it a lot more manageable and still leaves me with plenty of ingredients to work with. I find the frozen veggies to be just as delicious, and the fruit to be better than fresh. Because it’s picked and frozen at the peak of ripeness, the fruit often has way more flavor than the fresh produce that’s traveled miles at ambient temperatures. Plus, it’s super convenient to have frozen fruit around if I want a thick smoothie. Soy sauce became a staple condiment after I went vegan. From stir-fries to blending up savory sauces, I was now using it several days throughout the week. The problem was, the little bottles in the grocery store were three or four dollars a pop, which was starting to add up quickly. Not to mention I had to run back to the store to restock whenever I ran out which cost me time and gas. The solution? I started to stock up on the 64-ounce bottles of soy sauce from Costco, Amazon or Jet. Super easy and I never had to deal with running out again. Another quick word of advice when buying soy sauce: never buy the low-sodium variety! If you do, you’re just paying the brand to dilute their product with water which you could easily do at home by yourself. Hummus is a great snack, but it’s not cheap when you get it pre-made. But the fact is, all of the raw ingredients are super inexpensive on a per pound basis — even if you don’t buy them in bulk quantities. If I’m making hummus for several people, I learned that I can use a large container, multiple cans of chickpeas, tahini, lemon juice and an immersion blender to make a large serving for pennies on the dollar. Also, by having all the ingredients on hand, I can whip up a small batch and not worry if I’m going to waste any by throwing it out. After all, the most expensive foods are the ones that you don’t eat! Medjool dates are an unbelievably delicious dried fruit that can be used to make everything from sweet and savory sauces to vegan cheesecakes. They also make a great snack. The problem is that they’re ridiculously overpriced at the regular grocery store. I could easily go through a whole box of dates in one sitting or with one recipe, which means that was $10-12 down the drain. Luckily, I was able to find a Middle Eastern grocery store that sells them for way cheaper in bulk. If there’s no such store near you, you can check specialty date online stores like 7HotDates which offer great deals when they’re in season. To maintain the best quality for months on end, I like to store them in the fridge. Like some of the other products, I’ll also order them in bulk from the big online retail sites, but the specialty stores always have the best deals. As a final recommendation, just know that these aren’t the only items that you might end up spending too much money on. Whether you intend on going fully vegan or mostly plant-based, just remember that the cheapest options are also the most health promoting. I promise that if you stock up on foods like beans, legumes, whole grains, cheap veggies (like peas, broccoli, and cabbage) and bulk nuts, you’ll have no issues staying within your budget. Joe is the head blogger at ThriveCuisine.com. He’s a frugal vegan foodie who believes you can eat great on a budget. In his spare time, he likes walking his dog and practicing jiu-jitsu.